"Historical performance based trade risk management"
Developed in 1956 by John Kelly, an AT&T employee, Kelly Criterion is an optimal growth strategy. The formula quickly became popular in the gambling community as an optimal betting system. It allowed gambles to maximize the size of their bets over time. Nowadays, the system is used by many top money managers as a general money management system. One very important criteria, your trading system must have a Positive Expectancy and a minimum of 100 historical trades (see the Expectancy Tool). Kelly Criterion, works by looking a traders historical win/loss and gain/loss performance and optimizes the next trade risk basis on overall performance history. This money management system is best for systems traders. Let’s say have 50 winning trades out of a 100 total historical trades. My avg. historical trade gain is $105 and historical loss per trade is $90. 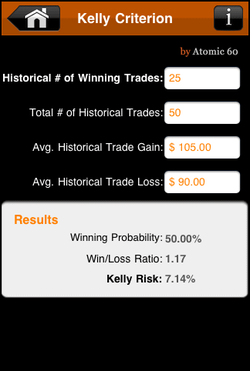 The result is a Winning Probability of 50% with a win/loss ratio of 1.17 and a Kelly Risk of 7.1%. This means my next position size can be 7.1% of my portfolio. Some things to keep in mind. Generally speaking, never risk more then 20% of your portfolio on a single trade. Safe position sizes should fall within 0.5%- 10% of your portfolio’s overall value. Also, Kelly formula can cause substantial volatility which can be more then some investors can stomach. Many traders us “Half Kelly” in an attempt to reduce portfolio volatility.